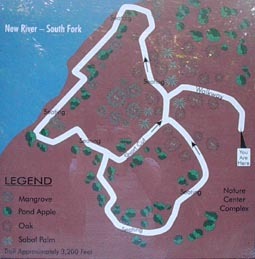 This is a basic Map of the New River Trail. 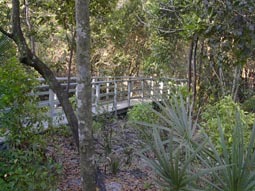 This trail is a 3200 foot, wheelchair accessible boardwalk. The trail first winds through a Laurel Oak Hammock. Next, you find yourself over a freshwater swamp wetland. 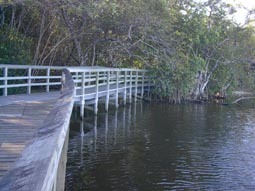 the trail becomes a saltwater wetland with mostly Pond Apple and Mangroves. The start of the trail takes you through the Hardwook Oak Hammock. The tall Oak branches form a shady canopy that allows many plants to flourish below. This trail gives you a great opportunity to see wildlife very close-up ! 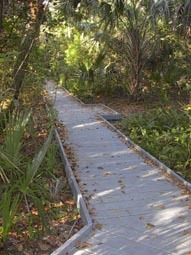 Soon, the Boardwalk becomes elevated as you pass over the freshwater wetland. Look below and you can see small crabs and other scavengers in the swamp. Bald Cypress and Red Maple make up most of the canopy here. The boardwalk trail meets up with the New River. Many wading birds can be seen here. 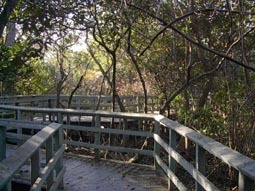 Pond Apple and Mangroves make up the saltwater wetland. 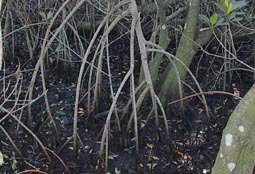 The Red Mangrove has strange looking propped-up roots. They serve to stabalize the shoreline and provide coverage for many small animals and fish.